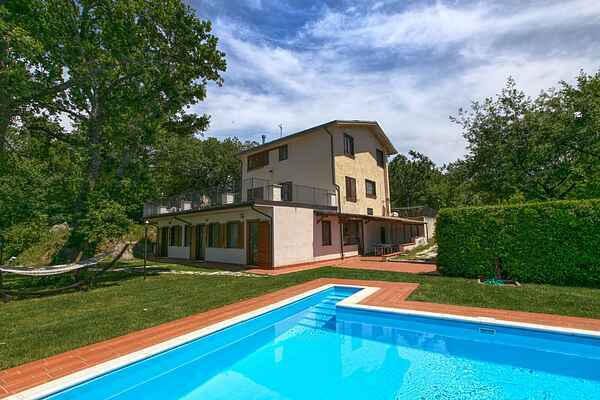 Holiday home Insieme is located in the country in a hilly region near the town of San Valentino among olive trees and forests. The house is surrounded by the wonderful green of the garden and the oak trees, and offers the option to enjoy and relax in the garden or at the edge of the beautiful swimming pool. The house is tastefully furnished with a great deal of charm, with much light and warm colours. You step directly into the garden from every bedroom. It is a region with a rich historical, cultural and gastronomic tradition, and the area is known as the green heart of Europe. You have a view of the Majella mountain range and the Gran Sasso, beautiful nature parks which are definitely worth a visit. The owner of the vacation home has three beautiful horses. It is possible to bring your own horse as there is a stable. From the holiday house you can make beautiful walks in the park Majella, also suitable for trips with a horse.